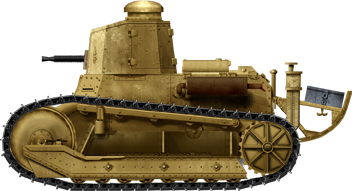 When Italy received 4 French Renault FTs, in early 1918, it was barely recuperating from the crushing defeat of Caporetto. The design made such an impression that FIAT was immediately ordered to build a copy, which had to be ready for mass-production by the fall of 1918. 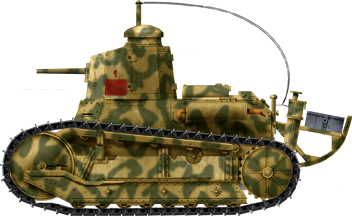 The FT became the blueprint for the FIAT 3000, the second Italian-designed model, but the first to achieve operational status in the peninsula. But replicating the French model was not enough, and FIAT chose to implement many improvements to the design. As soon as the plans were ready, 1400 units were ordered, the first deliveries being scheduled for May 1919. The armistice brought these plans to a halt, and the initial order was at first cancelled, then reduced to 100 units. 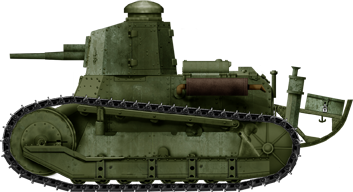 The FIAT 3000 bore a strong external resemblance to the Renault FT, but the hull was shortened and widened. The four pairs of twin road wheels were protected by a new side skirt with four mud chutes, the track links were shorter, the suspension was slightly reworked, armor was somewhat increased, and the new octagonal turret was much higher. The FIAT 4-cylinder air-cooled engine was also much more powerful than the original Renault, which resulted in a speed surge, going from the Renault’s 6 km/h (4 mph) to 18 (11 mph), and even 21 km/h (13 mph) for the model 30. The exhaust was protruding from each side. The unditching rear tail was kept almost unchanged, but modified to hold storage boxes. The biggest innovation was the adoption of twin Breda 6.5 mm (0.25 in) air-cooled machine-guns, with 5000 rounds stored internally. This armament and its fittings were named Model 1921, because it was accepted in service that year. The original batch of 100 units was built until 1926, differing by minor modifications and a new pair of 6.5 mm (0.25 in) Breda machine-guns, posted higher in the turret on the serie II. After 1922, concerns appeared about the lack of a proper gun for this model, and a 37 mm (1.46 in) model 37/40 was thought to be the most suitable answer. Some trials took place using a regular model 1921 during 1928-29, which ended with a modified design, the FIAT 3000B. 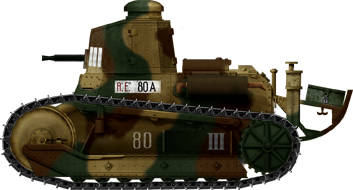 The carro d’assalto Fiat 3000, Mod. 30 was not only equipped with a long-barrel, moderately high velocity gun, but also had a new, more powerful engine, delivering 65 bhp at 1700 rpm. Other differences include improved suspensions protected by a sloped mud chute, new engine compartment and new external stores. A limited number of these model 30s were rearmed with twin machine-guns. Only 52 were built overall, from 1930 to 1933. They were still in service when the war broke out in 1939, mostly in colonial areas. Only a few FIAT 3000 model 21s were sold abroad, due to their moderate price. They served with the Royal Albanian army and the Latvian army. Some were also part of the puppet government of Abyssinia (Ethiopia). Their first and most well-known use was during the conquest of Ethiopia, after the first Italo-Ethiopian war of 1927, which ended with the treaty of 1928 defining the definitive borders between Italian Somaliland and the Ethiopian empire. Facing no resistance from the League of Nations, the Italian colonial army built the Welwel fort in 1930, encroached well inside the Ethiopian territory and beyond the agreed border limitation. After several patrol incidents and official Ethiopian protests, a clash occurred in December 1934, which led to a full-scale war. This invasion was supported by nearly all available Model 21s and a few Model 30s, which proved successful, since the Ethiopian army lacked any form of armor or efficient anti-tank weapons. Ironically, most of the 595 tanks fielded by the Italians were CV-33/35 tankettes, which were opposed to the three FIAT 3000 model 21s previously sold to the Ethiopian government, and a handful of hastily-built Ford-based armored-cars. Three other FIAT 3000s were sold to the Hungarian government in 1936, which fought during the Slovak–Hungarian War, in March-April 1939. When World War Two broke out, most of the FIAT 3000 still in reserve, which had been used in training units, were reactivated in June 1940, due to a lack of tanks for upcoming operations. While most were based overseas, in colonial duty in Eritrea, Libya, Abyssinia and Somaliland, some were retained in local defense units, in Southern Italy and Sicily. 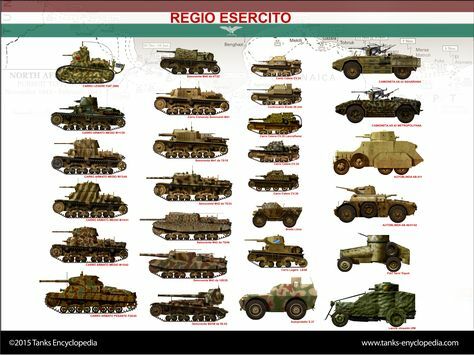 At this moment, all FIAT 3000s had been renamed FIAT L5/21 or FIAT L5/30, according to the new Regio Esercito nomenclature. They were hopelessly outdated, but, during the East-African campaign of 1941, they stood their ground against mostly third-rate British models (like the British Mk.I to VI light tanks), and ANZAC armored-cars. Two units equipped with FIAT 3000 also fought during the Albanian campaign, but proved totally inefficient in Greece. Their last memorable action occurred during the landing at Gela, part of the Allied Husky Operation, in July 1943. Two units equipped with FIAT L5/30s operated as mobile gun positions around the bridgehead. None seem to have survived to this day. FIAT 3000 Model 1921, serie I, Abyssinia, 1935. 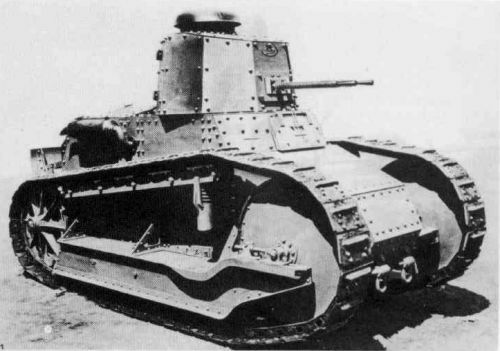 FIAT 3000 Model 21 serie I, Italy, 3rd Battalion of the 1st Armored Division, 1924. FIAT L5/21 serie II with radio, Corsica, March 1941. FIAT L5/30, Italy, Calabria, January 1939. The most famous picture of a 1929 FIAT 3000 serie I, or model 21.